You know how when you move into a new place, there is a room or part of the home that you always intend on “doing something else” with but it ends up getting put off to another day? For me, this room is our Guest Bedroom at the house. Sure, it served its purpose of welcoming our guests for a night or two stay, but it just never was quite what I had in mind. My redecorating dreams came true, however, when Serena & Lily and I decided to collaborate on the redesign of the room. 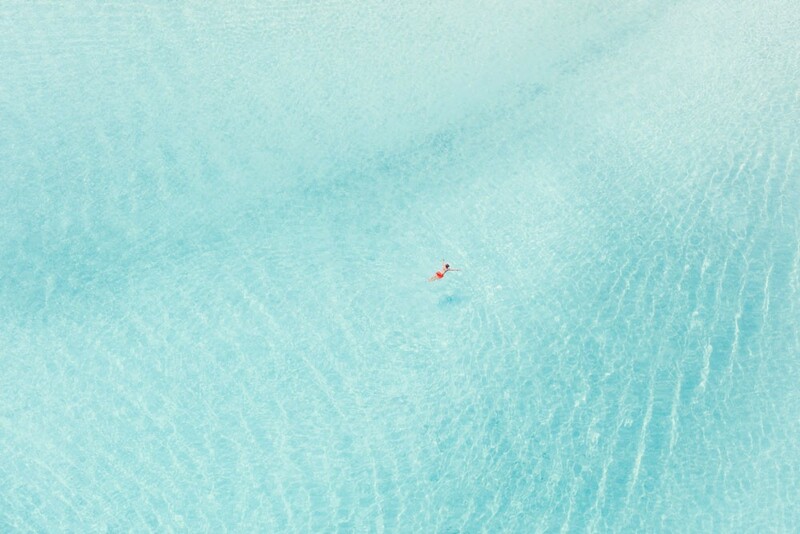 Backing up a little bit, I recently released new images to the A la Plage series of Bora Bora. 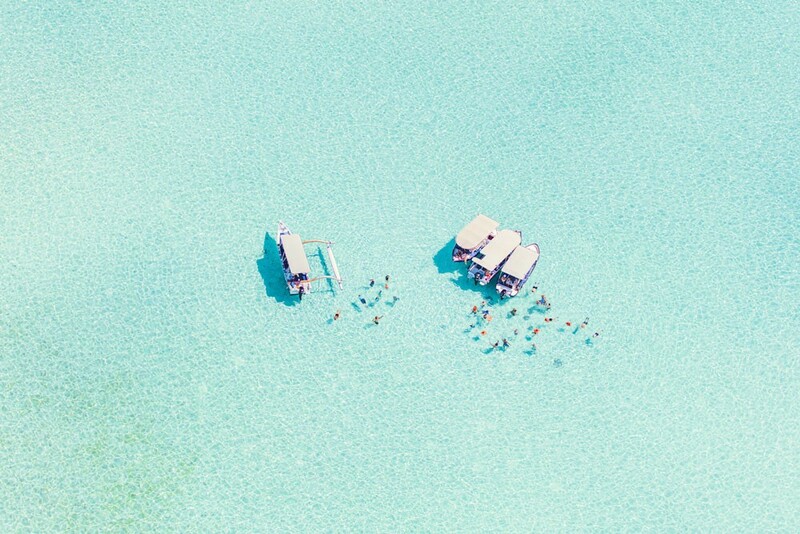 If you have ever been to this tropical oasis, then you already know that everyone should wake up to Bora Bora, if they can. Inspired by the soft palate of these new images, I finally found the incentive to tackle the redesign project. I have been a long time fan of Serena & Lily but after my recent book signing inside their store in the Hamptons I legitimately became obsessed! After a brief chat with the Serena & Lily design team about the direction I wanted to take the room, we got down to making some decisions. 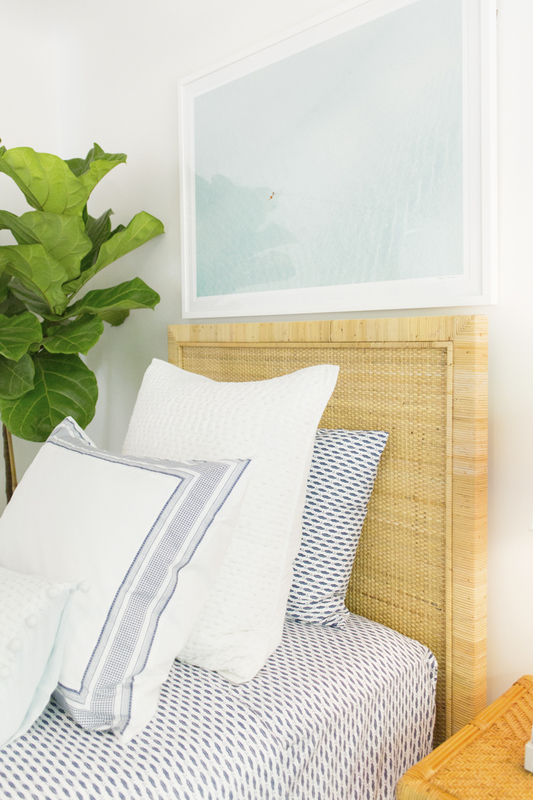 Based on my Bora Bora print selections, I knew I wanted to create a ‘coastal cabana’ feeling with the decor, yet not too theme-y. I also was inspired by a friend’s guest room I recently stayed in to add twin beds rather than an expected queen. Though smaller, they were more playful to me and certainly more versatile for guests so I placed an order for two twin Balboa Beds. 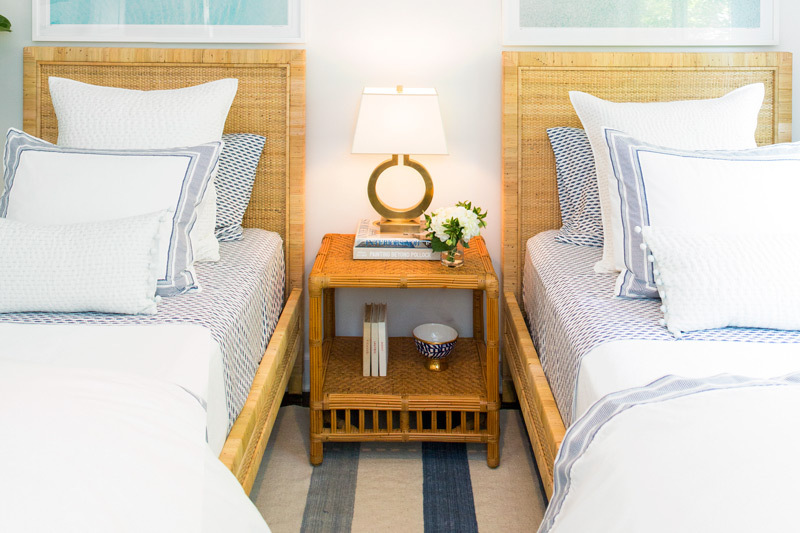 I loved how the textured rattan bed frames immediately elevated the room. 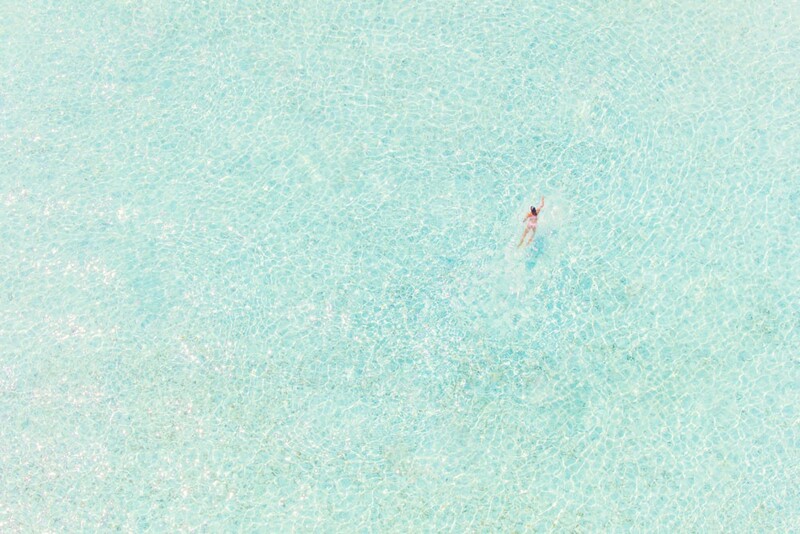 The woven effect offered a depth of warmth that immediately catches your attention, and they went perfectly with the sparkling waters of Bora Bora. 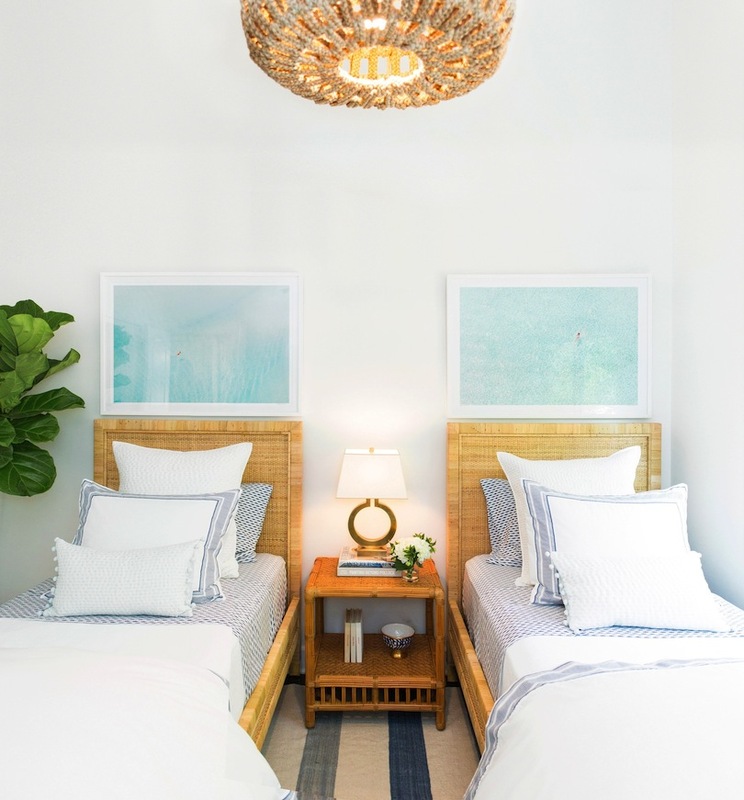 Rounding out the furniture selection, I went with the matching Balboa Table as well as their very cool, Morro Pendant lighting fixture. For the left side aka “his” side of this Jack & Jill set up, I paired a medium white framed print of Man in Red Shorts, Bora Bora.. .
.along with his counterpart on the right side aka “her” side with Girl in Pink, Bora Bora. 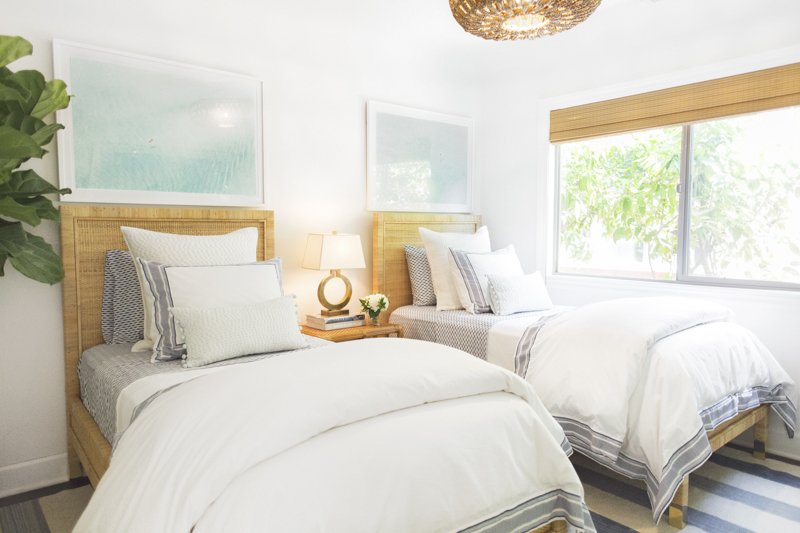 For the bedding, we went with the Amelie Sheet Set with classic white duvet covers and then added a bit of texture with the Metallic Pickstitch Lumbar pillows and shams. I love the poms on these pillow covers! 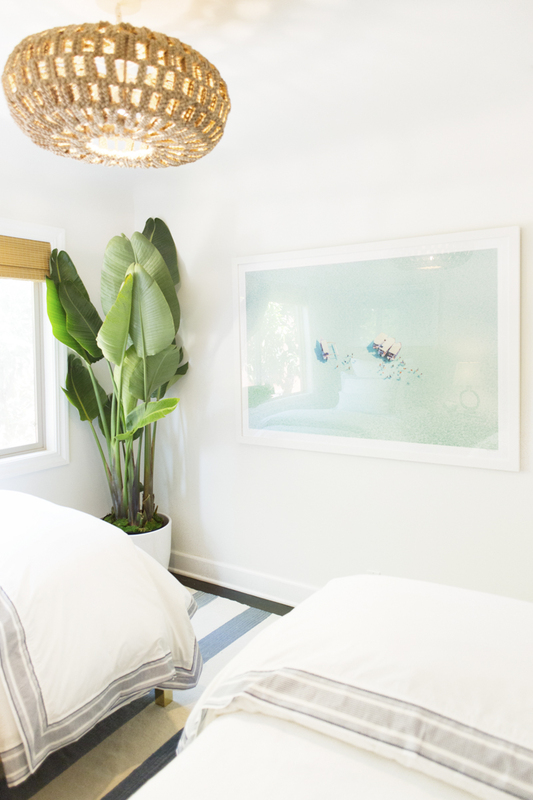 Then along the wall the beds face, I hung Day Trip, Bora Bora sized at large with a white frame to really fill up the space and give our guests something peaceful to look at when they wake up in the morning. Thank you all for coming Behind the Scenes with me on my makeover with Serena & Lily. 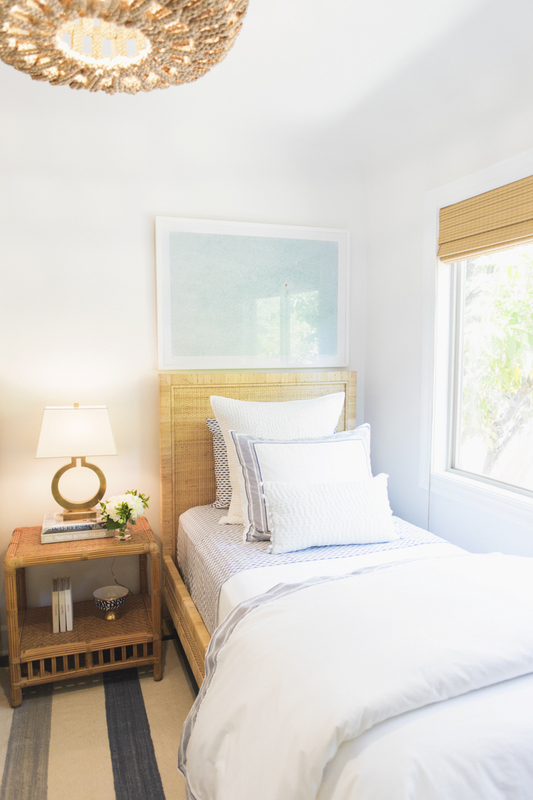 I have to say that before this redesign, I always felt like the Guest Bedroom was almost a throw away room, only used when company is in town. Now though, I feel like it’s my own little oasis getaway, right in my own home. With that in mind, I hope that we have inspired you to take on that “waiting for another day” project today!